Sampling Cylinders permit the extraction of a sample from a remote process location and provide safe containment for storage and transportation to the laboratory for analysis. 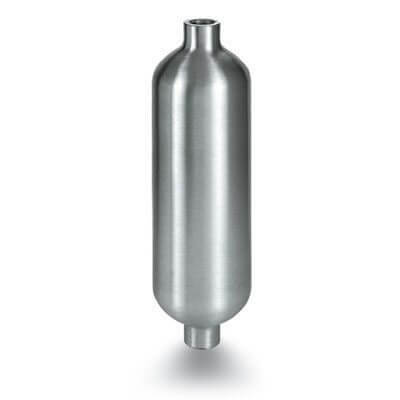 These cylinders are rated to 1800 psi at room temperature for liquids and gases. Some applications include hydrocarbon sampling in refineries, gas sampling in chromatography and condensate sampling in fossil-fuel and nuclear-power plants. In similar applications, petrochemical facilities and gas processing plants utilize sample cylinders. Pressure surge accumulators or reaction vessels are other common uses for sample cylinders. HAM-LET Needle Valves with Rupture discs were designed to be mounted on HAM-LET sample cylinders, the Rupture disc provides protection against over pressure in sampling units by venting the media to the atmosphere. The Rupture disc element is welded to a carrier that is assembled to the Valve with an O-Ring seal. A Rupture Disc unit can be easily replaced in the field while the valve remains connected to the sampling unit.